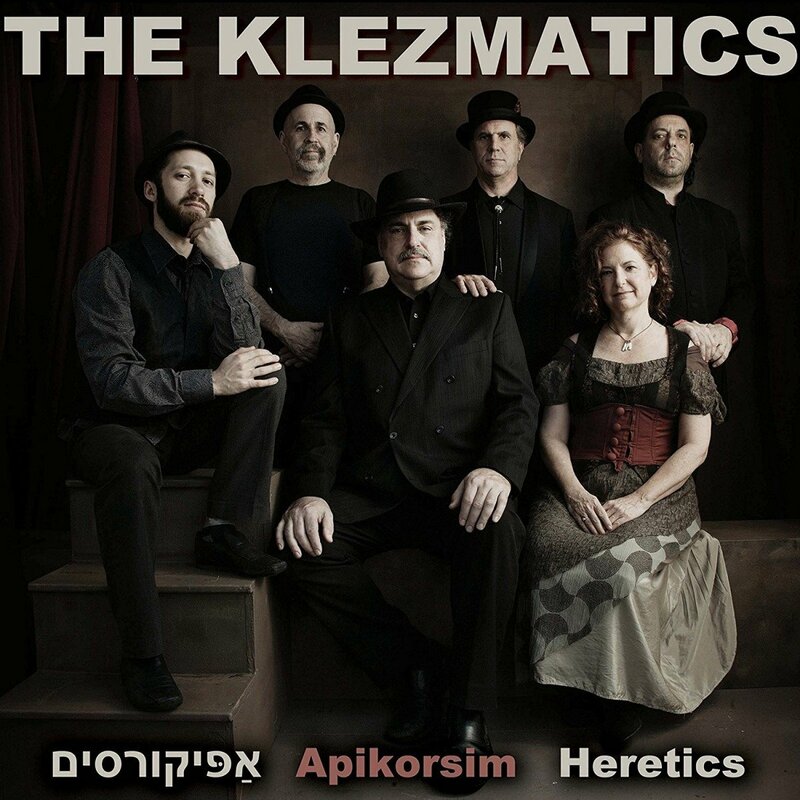 The Klezmatics: Apikorsim (Heretics) | Oy Oy Oy Gevalt! The Klezmatics was also the first klezmer band to explicitly incorporate punk sensibilities into some of its music, albeit not as a defining quality that applied to all songs and not as a punk rock band. From the get-go, the Klezmatics looked to create “a new klezmer with a punk attitude,” as one album’s liner notes put it. … Some songs were certainly spirited and frenetic with fast tempi, but it is up for debate whether those qualities were firmly rooted in klezmer or due to the punk attitude. [Former] Violinist Alicia Svigals said that when the Klezmatics “speed[ed] up tempos,” it was “in an emulation of a punk” aesthetic “rather than a cartoon aesthetic.” Trumpeter Frank London referred to parts of some songs as “punk klezmer”: “What we’ve done is, we’ve taken the rhythms of klezmer, or the old things, and play them on other instruments, a lot louder. More amplification, more guts; it’s taking the rhythmic impetus and letting that motivate it.” The Klezmatics’ occasional “punk klezmer” was not klezmer mixed with punk rock. Rather, it was klezmer that was inspired by punk and “emulate[ed]” a punk aesthetic with its tempo and intensity. The album’s title track portrays a utopian vision in which “happy heretics” “dance in a circle,” “don’t think about G-d,” “don’t worry about punishment,” “have no rabbi,” and “don’t get circumcised.” Lyrically it’s pretty punk, even if not musically. Of course, not everything has to be viewed from a punk perspective. “Shushan Purim” (with lyrics by Yiddishist Michael Wex) is about “drinking until your head gets all messed up” and the hangover the next day. Purim starts tonight, so the song will be timely and relatable for many Purim partygoers. The Klezmatics are The Clash of klezmer. Back in the 80s, The Clash were the one punk band that pretty much everybody knew and loved, and the Klezmatics were their Jewish folk-punk counterparts – although their musicianship was always a cut above even the most talented punk rock band. … The Klezmatics, on the other hand, brought the transgressive energy of punk to a vast legacy of global Jewish sounds, and vice versa. The new album only further cements their reputation as innovators and instigators, a band whose influence long ago reached far beyond the klezmer demimonde. It’s safe to say that without the Klezmatics, there probably would be no Gogol Bordello and probably no World Inferno either.